Staff was great , always ready to answer questions . I had a very specific requests for invoices and they changed it twice for me. There is a fitness center at the hotel next door with sauna, swimming pool and gym. Entrance fee applies. Centrally based, with on site parking and large spacious property. The location was amazing as well as the view. Depending on the apartment, some were new and other were a bit older. 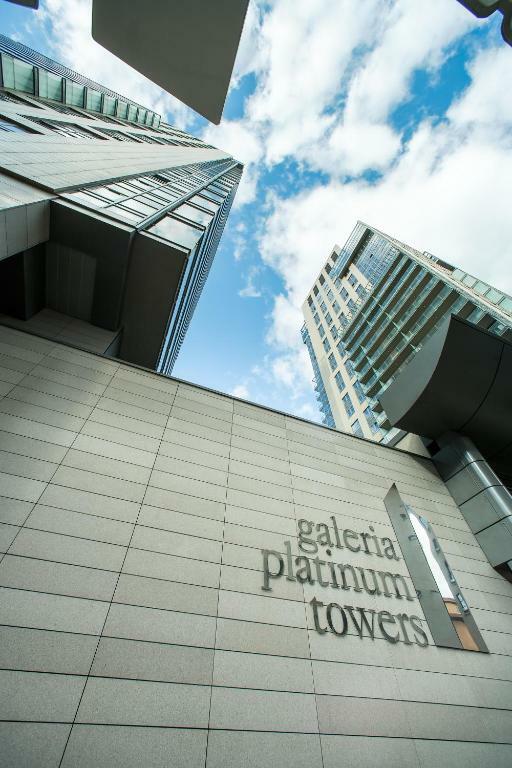 Lock in a great price for Platinum Towers E-Apartments – rated 8.1 by recent guests! One of our top picks in Warsaw.Located in the center of Warsaw, Platinum Towers E-Apartments offer accommodations with free WiFi, a kitchenette and an LCD TV with cable channels. The accommodations offered by the Platinum Towers E-Apartments is stylish and features a modern interior design. The apartments are bright, and includes a seating area, balcony and a private bathroom with a hairdryer. The kitchenette is spacious, and offers you everything you will need to make a meal such as a hob. It also has a dishwasher, so the washing up will not be a hassle. Guests of E-Apartments have access to the facilities offered by the Platinum Towers complex, such as a fitness center, a swimming pool and a sauna, at an additional surcharge. These centrally located apartment are only 0.9 mi from Świętokrzyska Metro Station, and 0.7 mi from Warsaw’s Central Railway Station. Złote Tarasy Shopping Center and the Palace of Culture are within 0.8 mi. When would you like to stay at Platinum Towers E-Apartments? 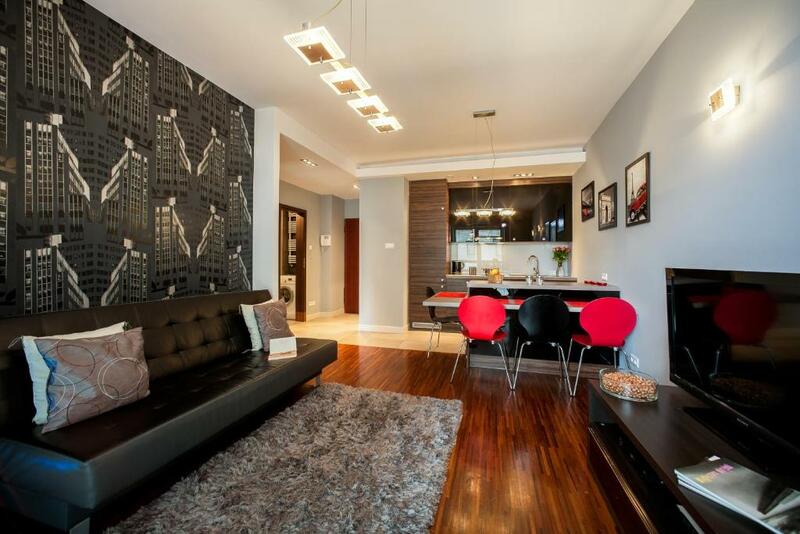 This bright apartment is spacious and features a stylish, modern interior design. It includes a cable TV and a private bathroom with a shower. Located at ul. Grzybowska 61A. Private parking is available on site (reservation is not needed) and costs PLN 60 per day. This bright apartment features a stylish, modern interior design. It includes a cable TV and a private bathroom with a shower. Located at ul. Grzybowska 61A. A spacious suite located at Grzybowska 61b Street. This spacious apartment is done in light colors and is located on the 17th floor. It is located at ul. Grzybowska 61. Wyjątkowy budynek w sąsiedztwie z hotelem Hilton, położony w cichej okolicy w pobliżu najlepszych warszawskich atrakcji turystycznych. Firma od 5 lat zajmuje się wynajmem nowoczesnych apartamentów, położonych w najlepszych lokalizacjach Warszawy. Satysfakcja naszych Gości jest dla nas priorytetem. Słynna warszawska Wola, miejsce głębokich tradycji i historii Warszawy. W okolicy Plac Europejski, klimatyczne kawiarenki,restauracje, basen,SPA, atrakcyjny plac zabawa dla dzieci obok. Na piechotę można dotrzeć do Muzeum Powstania Warszawskiego. House Rules Platinum Towers E-Apartments takes special requests – add in the next step! Platinum Towers E-Apartments accepts these cards and reserves the right to temporarily hold an amount prior to arrival. Please note children cannot use the sauna, the fitness center or the swimming pool during week days. Please inform Platinum Towers E-Apartments of your expected arrival time in advance. You can use the Special Requests box when booking, or contact the property directly using the contact details in your confirmation. They could have been more informative. Like witch side to park on . Blue side . I parked on the green side the first time and had to pay again. Not happy about that. Really used up, it seemed as thought the place was not refurbished for years. I would pay a little extra to get more modern apartment look. Apartment was really standard, equipment was rather poor, rooms were clean but they do not offer anything extra. Clean and professional handling of guests! When we got there we had to wait for the person to come and give us the keys even if we had called previously. There was no air con on the room of the older apartment. There was little amount of cutlery and crockery. Receptionist not very helpful. Wanted to book taxi to airport. Gave me the number which did not work, woukd have took her 2 mins to call them for me. Certainly not busy so no excuse really. in the end i got some help from the receptionist in building next door. Hot shower and property was clean.